There's a battle brewing in the backyard and only you can save the day! 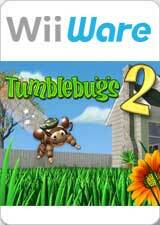 Tumblebugs 2 is the hit action-puzzler in which Black Bugs are rounding up and trapping the peaceful Tumblebugs underground. Now the black bugs are back. And they are meaner, faster and nastier! They've crashed the garden party and are rounding up the colored beetles. Once again it's Tumble to the rescue, but this time she's got backup. Call on your friends to help you battle your way through 89 stunning all-new levels. Thrilling new powerups also help you free bugs better than ever. And who is behind this black bug invasion? The graph below charts the compatibility with Tumblebugs 2 since Dolphin's 2.0 release, listing revisions only where a compatibility change occurred. This page was last edited on 17 January 2018, at 08:22.